Dr. Antonio “Tone” Ortiz is an ordinary single father in Miami, trying to ignore what flows through his veins, until his daughter, Jewel, goes missing. With all his options failing, it's up to Tone to find his daughter by any means necessary, even if that means signing his soul over to the devil himself: his father, Caltrone Orlando. Co-parenting has never been easy, and Kenya Gates will learn just how hard it is with the kidnapping of her daughter, Jewel. Even through all the sacrifices, secrets, lost love, drama, pain, and manipulation, these two fighting parents will come together with one agenda in mind: to save their daughter at all costs. But will Kenya also be willing to join up with Tone's dangerous father, or will she allow her emotions to get in the way? Behind the scenes, a legacy had been founded, one ushering in legendary murders and mayhem. Now it's time to understand the Orlandos, the seductive, lethal, and notorious family known for taking and leaving bodies behind. 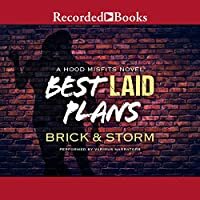 Journey with street lit authors, Brick & Storm as they tell another tale of the Hood Misfits' urban world.